Dan and I will be shooting at the Sculpture garden and Myrtle Edwards Park tomorrow (map). At noon/lunchtime we can use a few extras – want to be in the film? Here’s your first chance. You can bring a lunch and hang out on what should be a gorgeous day – now and then we may ask you to do certain extra like things (like walk on the trail, or sit in certain places). Please feel free to bring your friends or coworkers. Leave a comment or contact me by email so we can work out details. Cheers. Hi folks. Apologies for taking so long since the last update on the production of the short film We Make Seattle. It’s entirely my fault so if you have been giving dirty looks to the website or any of the crew, please re-aim those looks right here at yours truly. I’m pleased to report significant progress. Over the last month I’ve done audio interviews with three local entrepreneurs and creatives. These have gone well and I’ll continue doing them over the next few weeks. Soon we’ll post here on the blog with profiles of the people we’ve interviewed to share the stories we’re capturing and invite you to into the process. Greetings from the ‘We Make Seattle’ pre-production zone. We’ve been busy at work and have two updates for you. 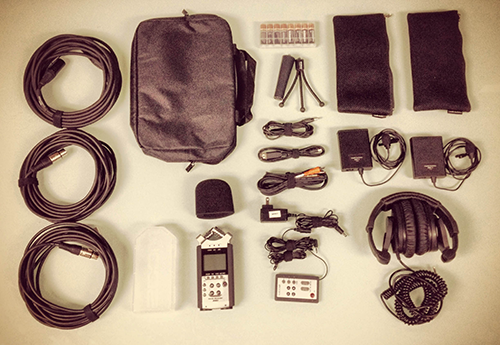 Since our last update, we’ve equipped Scott, our fearless writer/director, with his portable audio interview kit (see photo) and he’s been coordinating interview schedules with 10 candidates we’re considering for the film. From these initial interviews, the plan is to pick three specific people whose stories capture what is so special about Seattle as a great city for entrepreneurs, creatives, and makers. We call this the ‘glamorous’ part of pre-production – which comes entirely down to coordinating schedules with a lot of interesting busy people via email and phone. Since the backer meeting a few weeks ago we’ve been meeting regularly and working to cull down our list of over 60 possible candidates as subjects to the film to a workable number. I (Berkun) have been leading the process and have finally made some headway. I have about 10 candidates and will be reaching out to some of them over the next few days. As the vision describes, we’re looking primarily for voices that can tell first person stories of why Seattle is a great place for creatives. In terms of production, the first material we’re after is audio. I’ll be recording interviews with some of the candidates from the list and weaving together a very rough audio track for the film. We’ll discuss this in our production meeting and only then plan for what visuals will match the story we’re telling. This process makes tremendous sense, but it does mean a slower process for putting the film together. I’ll keep you posted as these interviews roll along. About 20 backers met with us on Saturday at The HUB to let us thank them for their support and to talk about the film. Silver sponsor Nick Finck even joined by Skype and Alex Algard, CEO emailed in a thoughtful list of ideas and suggestions. One fascinating observation was how many of the backers moved to Seattle: nearly everyone in the room had a story of why they chose to come here and their personal reasons for being happy with the choice. It was inspiring on its own to hear so many similar but different stories. The team has had two production meetings about the creative direction for the film and I wanted to update you on how things are going. As negative as it might seem it’s amazingly helpful to clarify what we’re not going to do and what we don’t want. Most of the reference films are cold. They try to tell the story of an entire city which is impossible, as the burden of comprehensiveness crushes narrative. Working with Constellation and Co. on the coasters and posters for We Make Seattle has been great. We love the retro, old school themes and the very Seattle palette of colors. As promised for this project, we welcome your input. For the 11×17 poster, here are four four alternative designs for the poster. Which one is strongest?